No more sneak peeks required, the new Baccarat Controlled Squeeze table from Evolution Gaming is now taking bets 24/7. 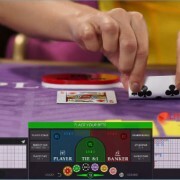 Identical house baccarat rules to all the other baccarat tables offered by Evolution, but with the novelty of allowing the player to reveal the cards in their own time and manner before the dealer turns them over. The game begins with the 2 cards dealt face down to the Banker and Player positions on the in-lay glass panels. You then have 15 seconds to ‘PEEL TO REVEAL‘ the position you have bet to, using your mouse. You can also choose when to view the other position cards, although this is a single click reveal. All seated players are afforded the opportunity to control their own squeeze, not just the highest staking player to that position (as is the case in Playtech’s VIP baccarat). I guess this this way everyone gets to feel like a high roller. After you’ve had your fun peeling and revealing, the dealer turns the actual cards and if required, deals the third cards to each position. You can peak at this one too. Squeezing the cards does take a deft touch with the mouse (good luck if you’re using a mouse pad, or your finger on the iPad!) but works pretty well, giving you the flexibility to peek from any corner or edge you choose. Doing the rounds a few moments ago, Controlled Squeeze table was already available at 888, Betvictor, Unibet and Leo Vegas (not William Hill unusually). The game can be played on PC or mobile. Now available at William Hill (& many more Evolution casinos).